This is a joint post with Maren Deepwell (cross-posted here). If you have missed our earlier posts we encourage you to revisit the beginning of the story of how we, as senior staff, lead our organisation to adopt virtual operations. This month we reflect on the first 3 months operating as a virtual team, delivering our first few big milestones and look back at the OER18 conference. 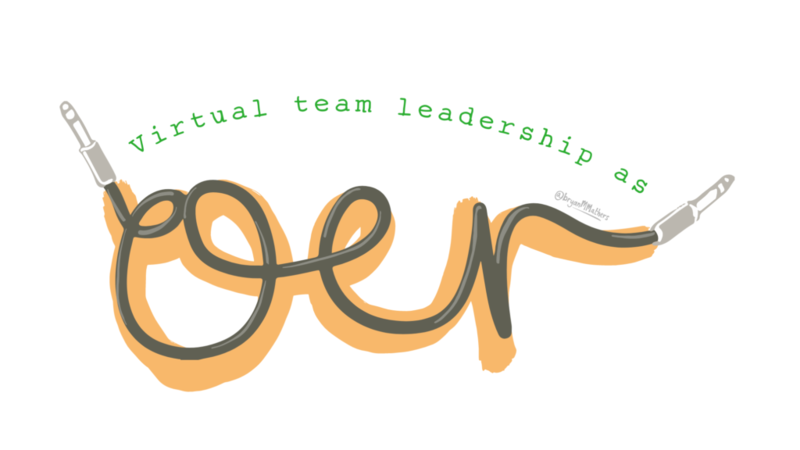 Maren: It’s been three months now since we transitioned to operating as a virtual team. Looking at the bigger picture, I feel we are on the right track [cue celebratory sounds here]. A lot of what we had planned and prepared for is working and with some of this year’s key deliverables successfully achieved, we have evidence that we are achieving what we need to. As an organisation we changed more than the way we operate over the past three months as we started to employ staff directly at the same time. For me, that part of the transition had to take priority over everything else. Payroll, pensions, tax and HR had to be in steady state, putting staff welfare, support and recruitment first. Those were the things I really worried about. So it’s a relief to have managed some of the biggest risks successfully and for more and more of the way we operate as a new employer to happen in steady state. When I reviewed our progress recently I realised that whilst I was focused on the transition, we have also made a lot of strategic progress – including delivering one of the largest events in our calendar, the OER18 Conference. What’s your perspective now that the event is successfully behind us? Martin: For me, I was interested in how the runup to OER18 conference would work out. This was our first big event where the entire team were distributed. With multi-day events I think it’s hard to appreciate just how much goes into them if you haven’t organised one yourself. Even in a digital age various things need to go to print, you’ve got material and equipment that needs to be delivered and there are some practical things like getting conference badges prepared. As part of our distributed organisation we now have distributed resources which needs some extra logistical planning to bring together at the venue. Overall this aspect went well but one of our couriers let us down and failed to pickup a next day delivery. As it happens the pickup was for some extra banners which in the end we could get away with not taking. Fortunately the bulk of material was handled by our regular courier who we have a long standing relationship with. The challenge now for us as a distributed organisation is we need to develop relationships with additional service providers, either out of doing things differently or because we are all not in the same place. This takes time and effort which I think should be factored in if you are thinking about moving your organisation to a distributed or virtual structure. Has OER18 highlighted anything for you we should take a new approach on? Maren: Yes, I think it has and it feels timely. The work on the conference felt like a useful way for us to pull together as a team and work together virtually. It helped highlight which parts of our new virtual set up are working well and it also made me realise how much has changed in a short space of time. Because the change has been strategic and welcome, it’s felt inspiring and positive overall, but we mustn’t forget that change takes time. Our expectations of what we want to achieve are high and sometimes I have to remind myself that it takes a lot of doing to put in place new ways of doing things. Doing something once isn’t enough. In my mind the kinds of considerations you are talking about, like building new relationships with suppliers, adapting what we do and how we do it, are helpful to me now – and to us as a team, but they wouldn’t have been a few months ago because there was no capacity to handle any more novelty. Now, when we evaluate the OER conference, I feel we have the capacity to put what we’ve learnt to good use in the run up for the next event. Another aspect of running an event as a distributed team I am thinking about is meeting up beforehand. For example, we had an evening to get ready this time, but not many hours at the venue. I feel this is particularly important for members of the team who are new and haven’t been part of delivering an event with us. As we are recruiting at the moment, I am considering that with new members of staff joining soon, ahead of a bigger conference I might value more time. What are your thoughts on this? Martin: Interesting point about time considerations. Knowing our Annual Conference is our next big event where we have at least 4 times more delegates it’s going to be important to factor in some of the practicality of badge stuffing and conference material gathering. Something that I only considered after OER18 was that we could do more to distribute our printing, both in terms of when and where it is done. For example, as part of our move to a distributed organisation we limited the purchase of printers to just getting one for our Finance Officer. I already use Google Cloud Print at home, which essentially lets you turn any printer into a network printer. Adding our printer to Google Cloud Print would allow us to share the printer with our team. There is still a logistic issue of getting materials we print to events but at least they would be in one location where we also have access to a reliable courier. The occasional printing we do is however only a small part of event delivery and in the bigger picture it would be useful to revisit our conference plan to see what we can prepare earlier to remove some of the end loading, like batching badge production. Whilst the Cloud Printing is a small example I think it reflects what you were saying about a wider change in the organisation. It feels like we have more agility in how we approach and solve problems. Maren: I agree with that. The first few months we had our preparations to build on and then the event to focus on, now we are moving on to the next phase: doing things differently, expanding (admin) support for virtual operations and updating our plans. The conference was a good catalyst to highlight the kind of questions you raise and also our skills and competencies and the gaps in them. One of the problems in Learning Technology I come across again and again is how to build a successful organisational culture when tech, expectations, milestones etc keep shifting. I relate to that in a different way now, because as you point out, we have a lot more scope now to be flexible, to solve problems creatively rather than having to work around them. We’ve committed to being more agile and I’m discovering what that means in practice for me as an individual, for us as a team and as an organisation all over again. Martin: Noted computer pioneer Alan Kay uses a quote from ice-hockey player Wayne Gretzky “[a] good hockey player goes to where the puck is, [a] great hockey player goes to where the puck is going to be”. If a system is in steady state everything is predictable, removing this means as an organisation we have more control about deciding where we want to be. By creating an organisational culture where there is scope for not following the puck we become more comfortable in not being in steady state, as a result more confident in finding solutions to problems as they emerge. Something I think required to make this successful is an existing confidence within the team … success breeds success. Next Post: GDPR compliance in Google Apps Script and G Suite Add-ons: Should you be concerned?